Since next Saturday is Chinese New Year, we here in THE DARK VAULT OF PUBLIC DOMAIN figure that this Saturday must be Chinese Christmas. Of course, we don’t always figure stuff like a lot of people do. But whatever Saturday is, join UNCLE PETE for a Brand New Episode this Saturday when he presents the double feature The Monster Walks and Broadway To Cheyenne. In our first feature, The Monster Walks, Ruth Earlton (Vera Reynolds) learns her scientist father has died – or maybe been killed – so she heads to his spooky mansion with fiance Dr. Ted Clayton (Rex Lease). Among those living in the house are Ruth’s Uncle Robert (Sheldon Lewis), a housekeeper, and her odd son Harris Crug (Mischa Auer). There’s also the ape-type thing in the basement left over from Dad’s experiments. Ruth has inherited everything, but there’s that clause in the will which gives everything to Uncle Robert should Ruth expire. When a hairy monster hand tries to kill Ruth, things start to get interesting. But is it the primitive primate or is there another monster afoot? From 1932 and also starring one of the busiest and most credited side-character actors ever, Willie “Sleep n’ Eat” Best, it’s The Monster Walks. In Broadway to Cheyenne, NYC policeman “Breezy” Kildare (Rex Bell) is shot during a confrontation with bad guy Butch Owens (Robert Ellis). While recuperating on his father’s ranch in Wyoming, Breezy finds that the dirty rats from New York are hiding out nearby and running a protection racket on the local ranchers. It’s up to Breezy to show the thugs some western justice. Also starring Marceline Day (Ruth Carter) and legendary sidekick Gabby Hayes as Walrus, and also from 1932, it’s Broadway To Cheyenne. 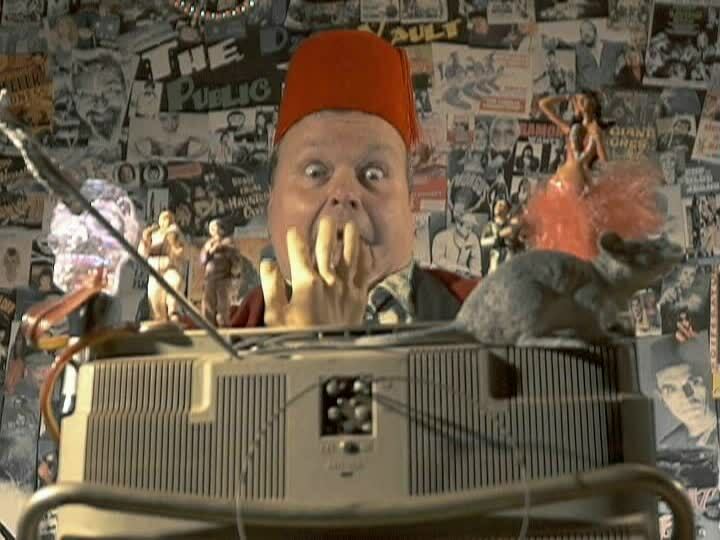 Back at the Dark Vault, UNCLE PETE is plunked down in front of the viewing device and besides being accosted by a mysterious hand and having a little snort of a bar-b-cue cocktail, he digs up a Three Stooges commercial too. So tune in this Saturday, January 21, 2017, from 10PM to midnight (with replays at midnight and 2AM) on channel 4 (Binghamton), channel 17 (Sayre, PA), channel 99 (Elmira/Corning/Hornell and Utica/Rome), and channel 30 in the North Country (Champlain/Watertown/Ogdensburg/Massena/Malone). It’s a CHinese Christmas double feature spectacular with The Monster Walks and Broadway To Cheyenne on the next DARK VAULT OF PUBLIC DOMAIN!!! ~ by UNCLE PETE on January 21, 2017.